Fits EL6980 Series, EL7000 Series and EL7020 Series Canister Vacuums. 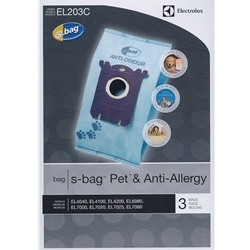 s-bag® anti-odour is a unique synthetic dust bag which absorbs unpleasant odours that develop inside the vacuum cleaner. If you own a pet, you will appreciate this unique smell-buster that also removes 99% of dust, pollen, allergens and other particles. Absorbs and neutralises unpleasant smells: When organic material, such as food scraps or pet hair, break down in the dust bag, unpleasant smell develops. This new odour absorbing agent, in the form of a wax sprayed on the entire surface of the s-bag® anti-odour absorbs the unpleasant smell and prevents it from escaping the bag. Performs well in filtration: s-bag® anti-odour offers 4 layers of effective synthetic filtration material, which give up to more than 2 times better filtration performance than ordinary paper dust bags. Is hygienic: The unique s-bag® closing system seals the bag the moment it is removed from the vacuum cleaner, which makes the bag easy to use and highly hygienic. Is highly resistant: This synthetic material in s-bag® anti-odour will not burst under powerful suction and the synthetic material will not be damaged when hard or sharp parts (like gravel & glass) are vacuumed.